In Islamic tradition, the Night Journey, Isra and Mi'raj (Arabic: الإسراء والمعراج‎, al-’Isrā’ wal-Mi‘rāğ), are the two parts of a journey that the Islamic prophet Muhammad took in one night, around the year 621. Many Muslims consider it a physical journey but some scholars consider it a dream or vision. A brief sketch of the story is in verses 1 and 60 of one of the Qur'an chapters (#17: sura Al-Isra), and other details were filled in from the supplemental writings, the hadith. The event is celebrated each year via a festival for families, the Lailat al Miraj, one of the most important events in the Islamic calendar. Muslims bring their children to the mosques, where the children are told the story, pray with the adults, and then afterwards food and treats are served. In March, 1951, Prime Minister Mohammad Mossadegh, a nationalist, received the vote required from the Iranian parliament to nationalize the British-owned oil corporation, Anglo Iran Oil Company, in a situation known as the Abadan Crisis. Despite British pressure, including an economic blockade which caused real hardship, the nationalization continued. 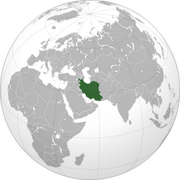 In 1954 it was suspended by the Shah, who in 1973 re-nationalized oil. The Day of Ashura (عاشوراء (ʻĀshūrā’, Ashura, Ashoura, and other spellings) is on the 10th day of Muharram in the Islamic calendar and marks the climax of the Remembrance of Muharram. It is commemorated by Shia Muslims as a day of mourning for the martyrdom of Husayn ibn Ali, the grandson of the Islamic Prophet Muhammad at the Battle of Karbala on 10 Muharram in the year 61 AH (October 02, 680 AD). According to Sunni Muslim tradition, the Prophet Muhammad fasted on this day and asked other people to fast. Sunni Muslims also celebrate the day claiming that Moses fasted on that day to express gratitude to God for liberating the Israelites from Egypt. In some Shia countries and regions such as Afghanistan, Iran, Iraq, Pakistan, Lebanon, Bahrain, Commemoration of Husayn ibn Ali has become a national holiday and most ethnic and religious communities participate in it. Even in Sunni dominated Muslim community of India, Ashura (often called Moharram) is a public holiday.